Sage picked a bad time to invest in real estate, is all we’re saying. I’ll be heading down to MICE this weekend, and may even be wearing some official unofficial Saffron and Sage swag that I threw together at a custom print shop in like five minutes. I’m only going as a guest, though, but swing by if you’re in the area. Hopefully, next year, I’ll be an exhibitor, too cool and famous to hang out with you! And a hearty Ahoy hoy to all the visitors from Cassiopeia Quinn, which was nice enough to shout us out! 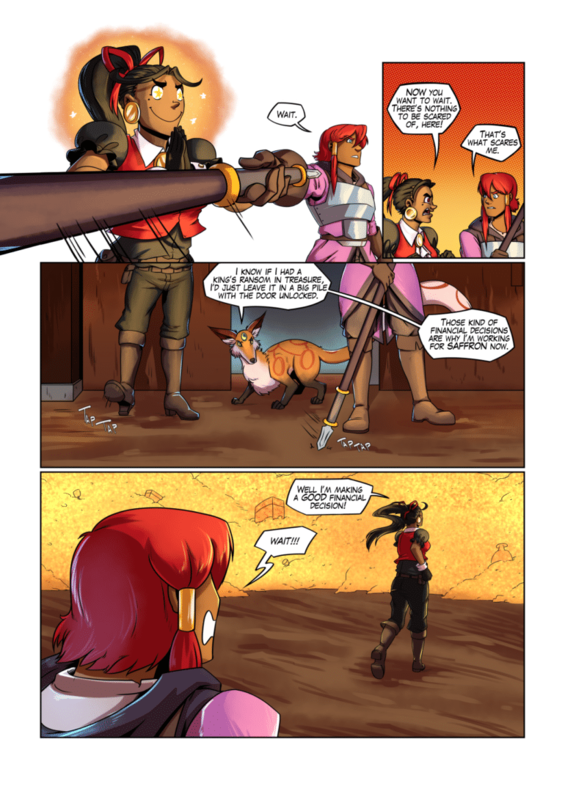 CQ are good people, and while we’re only three pages deep, we hope to soon show you why Gunwild considers us worth reading already. So stick around, grab a craft beer,throw on your favorite vinyl album, and get ready to tell people how you liked Saffron and Sage before it was cool. In the meantime, here’s an alternate final panel. Cassette: Now you want to wait. There's nothing to be scared of, here! Sage: I know if I had a king's ransom in treasure, I'd just leave it in a big pile with the door unlocked. Cassette: Well, I'm making a good financial decision! Wanna bet there’s something big and nasty UNDER the big pile of gold? Where’s Admiral Ackbar when you need him………………. I have a fealing we are about to find out why the comic is called Saffron and Sage, not Saffron, Sage and Cassette. 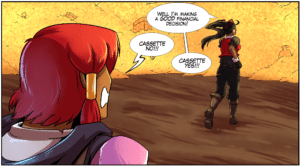 Well, I was into cassettes before this character was even named Cassette, so that’s like, triple hipster points. I do everything before it was cool… unfortunately most of them I’m still waiting for them to be cool. For example, I skipped the Man Bun and went for the Man Pig Tails, they should be cool any time now. I liked Saffron and Sage before it was cool! I get hipster credit for that. Wow, one of those three has NO genre sense at all. Clearly, Cassette has never seen “Ali Baba Bunny”.